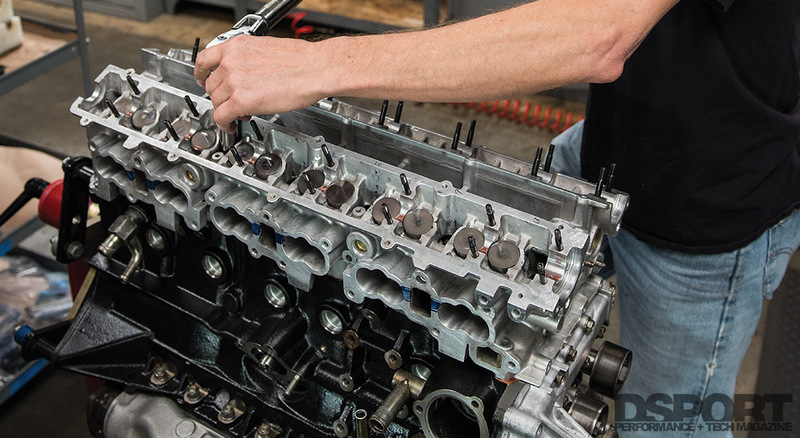 Bent or warped valves and reduced engine efficiency have plagued our 1,300+whp RB26DETT engine ever since we pushed beyond the 1,000whp mark a few years ago. For the longest time, we chalked up the bent or warped valves to extreme temps and the rigors of life at 600 horsepower per liter. 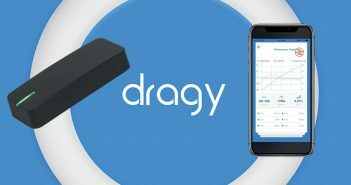 Thanks to new discoveries made in our Club DSPORT engine development center we’ve not only isolated the true cause of these issues, but also have discovered a solution to eliminate the issue at this power level. To see if your engine can benefit from this solution, we will first start by identifying the engines that would be susceptible to the problem. Second, we will explore the means of checking for the severity of the issue on an engine. Third, we will outline the solution and finally, we will show the improvement that the solution yields. Our first installment in our DSPORT Power Elite Series should have a number of engines running stronger, better and more reliably than ever before. Do you make enough power that you’ve needed to upgrade to aftermarket head studs and head gasket? If so, your engine is at risk for the issue. If you are making enough power to require larger diameter or super alloy (CA625+, L19 or H11) head studs with extreme fastener preloads (high fastener torque settings), there is a 90-to 100-percent chance that your engine has a problem. 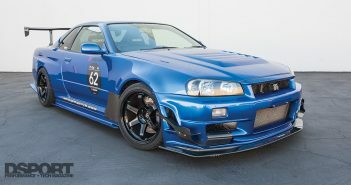 Every engine that we’ve tested at Club DSPORT has exhibited the problem (RB26, 2JZ, B-series, K-series, F-series, 4G63, etc.) but since we haven’t tested every family of engine ever created we need to allow for the slim chance that there is an engine design out there not suffering from the issue. Sometimes solving one issue allows one to push further ahead to find the next issue. In the early days of import performance, OEM head gaskets and head bolts simply were not designed to work with the elevated combustion pressures associated with forced induction or nitrous oxide injection. 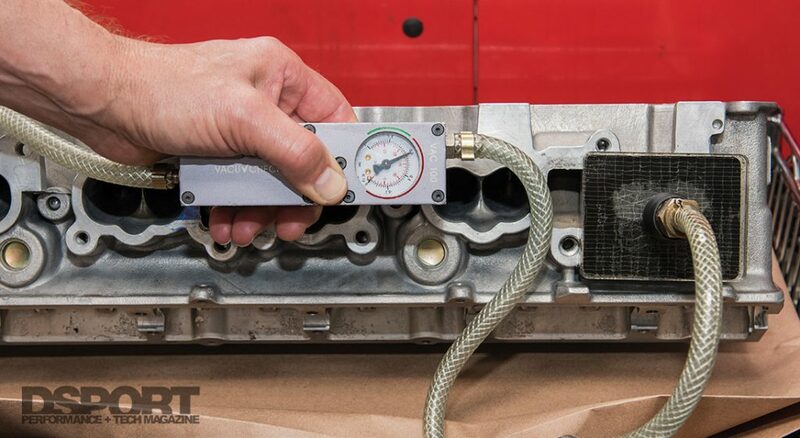 While increasing the cylinder pressure through forced induction or nitrous oxide injection escalates torque output, it can also be a quick way to blow the “fuse” in the engine. On many engines, the OEM head bolts and head gasket are designed to work like a fuse in an electrical circuit to protect the engine internals from extreme cylinder pressure levels. If you “built” the engine but used the OEM head gasket and head fasteners, the head fasteners and head gasket would likely fail well before the limits of the upgraded engine internals. It would be like having a 15-amp fuse on a device that pulls 60 amps of current. The fuse (head gasket) is going to blow long before the limits of the device (engine) are realized. Here’s a shot of the Nissan service manual for the RB26DETT engine. 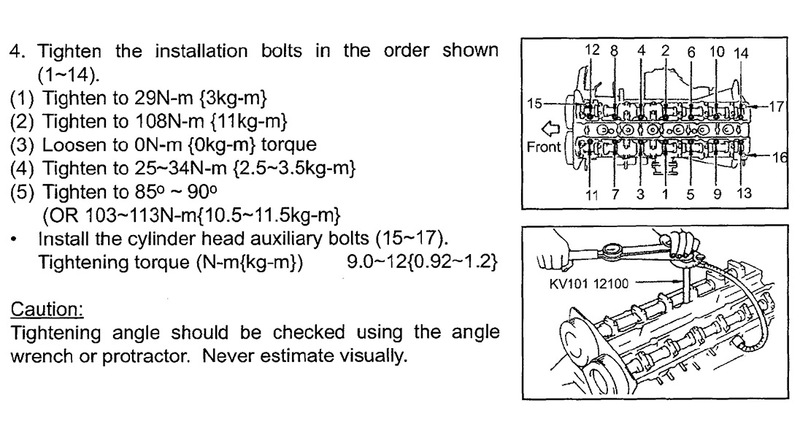 Notice how the factory specifies a tightening angle instead of a torque. 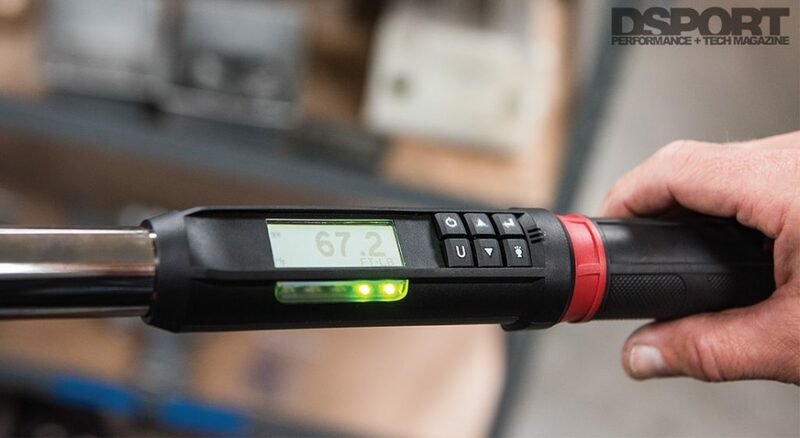 By using angle, instead of torque wrench readings, a more consistent preload across each fastener will be realized. Fortunately, putting a higher-rated fuse in any performance engine is easy to accomplish with the right parts which are readily available today. High-performance head studs and well-designed Multi-Layer-Steel (MLS) head gaskets have allowed higher specific torque (torque per liter) and cylinder pressure levels than ever before. Torque levels can now exceed 350 ft-lb per liter at the flywheel whereas 150~250 ft-lb per liter was the previous limit before superior fasteners and head gaskets were available. Higher torque has led to higher power. Whereas 200 horsepower per liter was a significant accomplishment 20 years ago, 600 horsepower per liter and beyond has been achieved on a number of engines built at our Club DSPORT facility. For years, ARP has been the “go-to” company for import performance enthusiasts for high-performance fasteners. ARP manufactures head studs from a variety of materials. ARP’s 8740 chrome moly alloy delivers a yield strength of 200,000psi and this represents the base offering in many of the ARP head stud kits for imports. The ARP2000 alloy features a 10-percent higher yield strength (220,000psi). ARP2000 alloy is standard on applications requiring more than the 8740 can deliver. For applications requiring the ultimate in fastener strength and increased preload, ARP offers its Custom Aged 625+ (CA625+) alloy that checks in at a yield strength that’s 30-40-percent higher than 8740 or 20-to-30 percent higher than ARP2000. These 260,000-to-280,000psi yield strength fasteners deliver the peak preload for a fastener of a given size. While L19 and H11 alloys have comparable yield strengths, the CA625+ alloy has superior resistance to hydrogen embrittlement. Hydrogen embrittlement occurs when L19 and H11 alloys are exposed to air or moisture. Those alloys must always be well oiled to prevent this problem while CA625+ doesn’t require special handling. Unfortunately, the same extreme fastener preloads that allow insane combustion pressures to be contained in the cylinder also present an undesirable side effect. The severity of the side effect is generally proportional to the amount of fastener preload. Hence, the highest-output engines that require the most fastener preload to maintain a head gasket seal are affected more than engines requiring less fastener preload. The 600+horsepower-per-liter RB26 engines that we’ve built for our “streetable” R33 GT-R require the maximum head stud preload attainable from a 12mm head stud. While the OEM fastener checks in at a set torque of 84 ft-lbs, the ARP2000 head studs get set to 105 ft-lbs while the CA625+ fasteners get set to 140 ft-lbs. 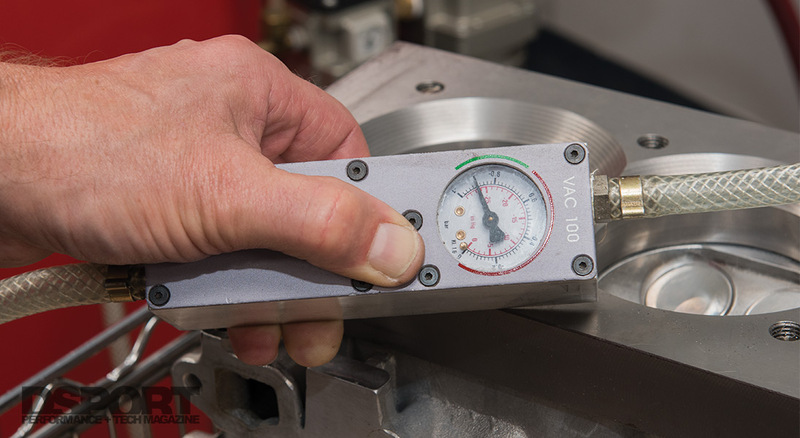 If you perform a “valve job” or machining of the valve seats on a cylinder head with a torque plate in place and then vacuum check the seal without the plate attached to the head, you’ll get the readings of a poor seal. In fact, the seal might be perfect. The testing method is flawed in this case. 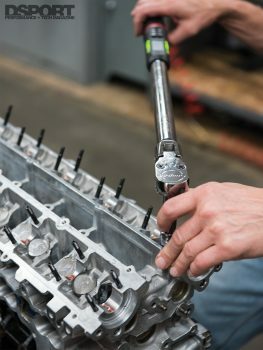 Instead, a vacuum check of the valve seal of a cylinder head that had a valve job performed with a torque plate in place requires the torque plate to remain in place for the test. The same cylinder now pulls significantly more vacuum. 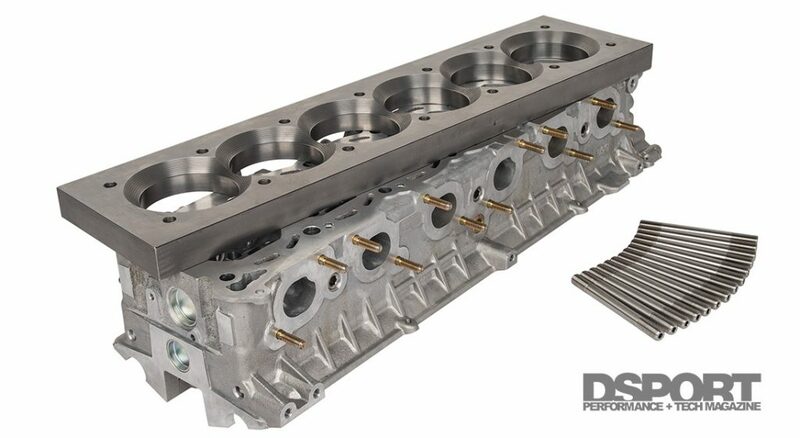 The higher preloads and stress required for head gasket sealing at extreme power levels cause the head to be strained more than its original design intended. As a result, the head experiences deformation. During this deformation, each valve seat in the cylinder head moves from its original position and loses its original shape. The valve seats at the ends of the cylinder head (#1 and #4 on an inline-4-cylinder, #1 and #6 on an inline-six-cylinder and all cylinders on a 4-cylinder boxer engine) move more than the cylinders closer to the center of the head. In mild cases, the result is a misalignment or misshaping of the valve seat that causes a slight leakage. An oval seat and a round valve aren’t the best match. Over time the valve may even warp into shape to reduce the leakage. 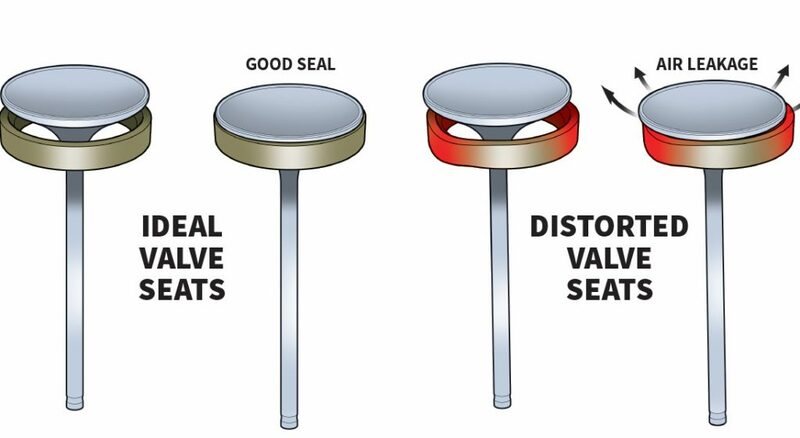 In more severe cases, the valve may be only making a limited amount of contact to the seat. If it is only contacting one side of the seat, three problems can arise. First, leakage between the valve and its seat will be excessive. Second, the limited contact area will limit the amount of heat transfer between the valve and seat. This can cause the valve to run at elevated temperatures making it more prone to failure. Third, the valve can be bent by the limited contact patch as it is literally bending a small amount every time the valve slams shut. High fastener preloads on the cylinder head cause a distortion to a valve seat that was machined without a cylinder head torque plate in place. The valves seats on the ends of the cylinder head are affected more than those toward the center of the cylinder head. 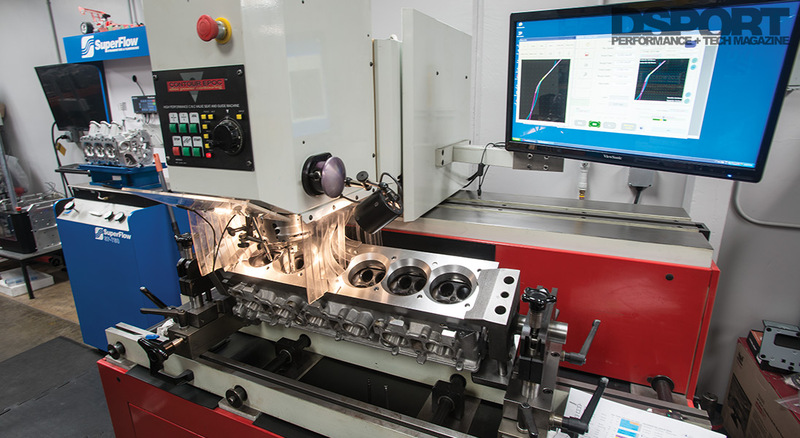 Distortion Correction Machining or DCM is a term that we use at Club DSPORT to identify the machining processes and procedures that allow for distortion correction. DCM is nothing new. It’s a technology that is most familiar with respect to cylinder honing. Torque plates, dummy heads and honing plates are different names for a device used to simulate the distortion that occurs in the engine’s cylinders when the cylinder head is bolted in place. Today, every competent engine builder would agree that there are measurable gains to be had by honing a cylinder with a torque plate bolted to the block. This is the only way to make the cylinder round once the head is bolted in place. At Club DSPORT, we machine our own torque plates for every engine family that is calibrated to deliver the identical distortion that occurs when the cylinder head is bolted in place. Since the valve seats in the cylinder head also undergoes distortion, the idea of using a cylinder head torque plate made sense. This torque plate would be fastened to the cylinder head at the running preload and then the valve seats could be machined to be round once the head is bolted to the engine. Unfortunately, no one makes a cylinder head torque plate for an RB26 engine so we had to make one ourselves. After debating about material selection, section widths and machining process and procedure, we settled on a 1-inch thick cast iron plate that we CNC machined and parallel precision ground. It was not a cheap date as materials and time cost us close to a $1,000. To allow for the Newen EPOC fixed-turning valve seat cutting machine to get its cutter to the valve seat, a series of stepped reliefs also needed to be machined into place. To test our $1,000 gamble, we cut a valve job on our cylinder head without the torque plate in place and ran our evaluation. We then removed the head and bolted the head torque plate in place before performing another valve job. Even during the valve job, you could see how the seat was distorted under the stress and strain of the torque plate. Once the valve job was completed with the torque plate in place, the plate was removed and we performed the same testing to evaluate the effectiveness of the DCM valve job. 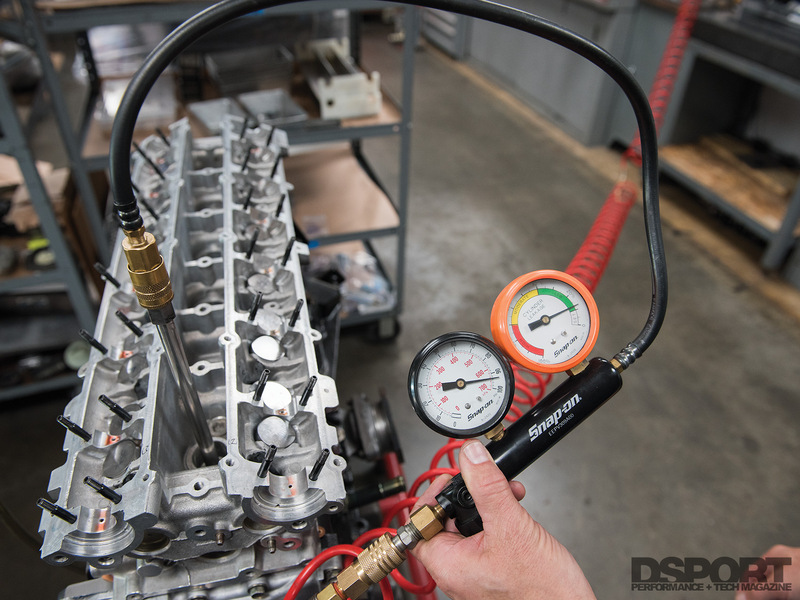 Since there isn’t a standard method for determining the severity of distortion to a valve seat, we decided to use some of the tests that we typically conduct on all engine builds at Club DSPORT. One test performed on every complete engine assembly is a cylinder leakdown test. This test pressurizes the cylinder with compressed air and measures the rate of leakage. The majority of leakage should only be occurring past the rings on a freshly built engine if the valves are sealing well against their seats. 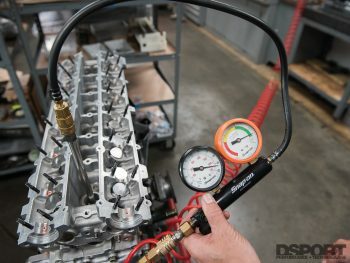 We also performed a vacuum test on the cylinder head with both a non-torque-plated and torque-plated valve job. We did this test with and without the cylinder head torque plate in place. A high-quality torque wrench that reads both torque and angle is a must for equalizing the amount of fastener preload on the head studs. 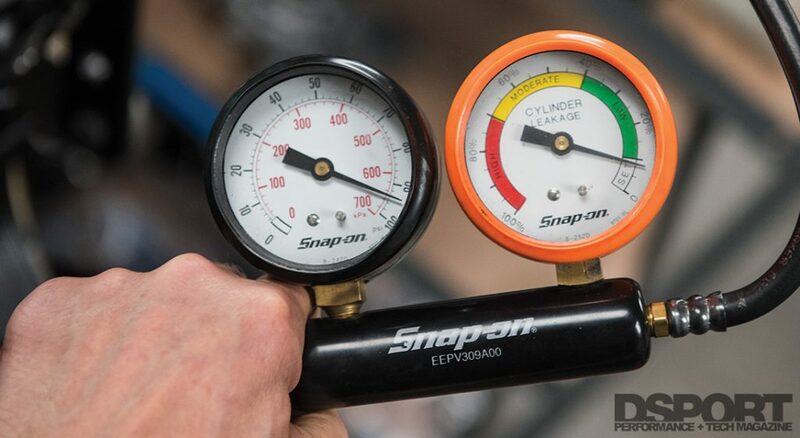 Before the cylinder head was bolted to the block, we checked the valve seal quality on the Newen EPOC vacuum gauge. When the valve job (cutting of the valve seats) was performed on the cylinder head in the conventional way (no torque plate), the valve seal checked out excellent without the cylinder head torque plate bolted in place. Once the cylinder head torque plate was bolted in place and torqued to spec, the quality of the valve seal diminished. This problem was worse on the end cylinders and virtually non apparent on the #3 and #4 cylinders. We then bolted this head to the block and we witnessed the same issue. 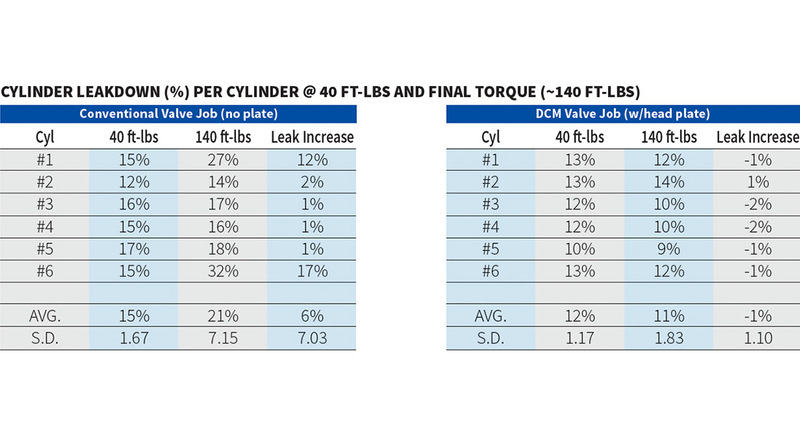 With the head studs torqued to only 40 ft-lbs (below even the OEM fastener level), the cylinder leakdown averaged 15% with a standard deviation of 1.7 points. The best sealing cylinder was #2 at 12% while the highest leakage was on cylinder #5 at 17%. Measurements were made along the way as the fasteners received a total of 190 degrees of angle to reach the final torque of 140 ft-lbs. At each interval, the leakdown from the cylinders at both ends of the engine increased. You could hear the leakage of air past the valves and through the intake and exhaust ports. By the time the cylinder head was torqued to its final spec (actually angle torqued), average leakdown had increased to 21% while the standard deviation was now 7.1 points. Cylinder #2 checked in at 14% (+2% over the baseline) while cylinder #6 soared from a base of 15% to 32%. There was massive leakage. Cylinder #1 didn’t fare much better as it increased from 15% to 27% during the process. In cylinders #1 and #6, the valves at the end of the engine appeared to have the highest amount of leakage. We assume that the contact between the valve and seat was likely enough to cause the bending and warping of valves that we had been experiencing in the past. Checking the cylinder leakdown of an engine before it is run is a great way to have some valuable data. When the valve seal is improved by the use of a cylinder head torque plate when the valve job is performed, cylinder leakdown will decrease. This is especially true on the cylinders at the ends of the engine. We then disassembled the head and performed another fresh valve job with the cylinder head torque plate in place. 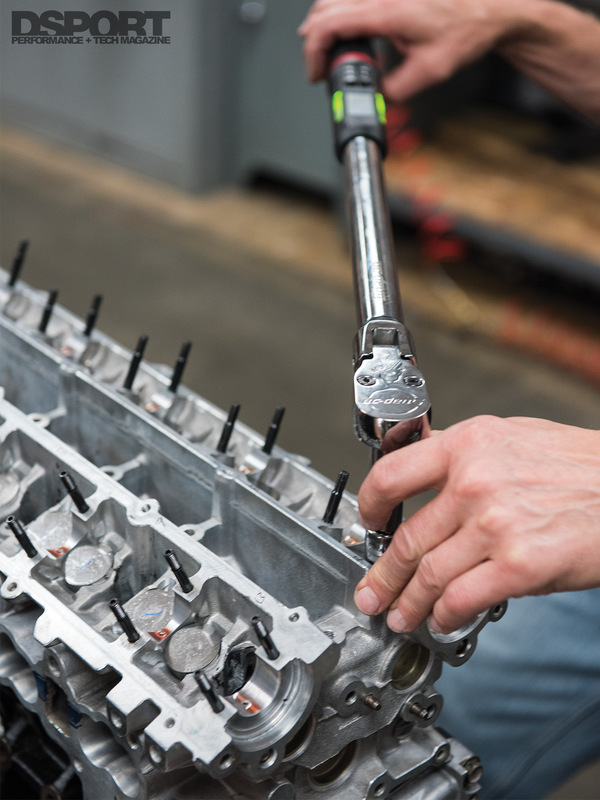 This process and procedure relies upon DCM to cut the valve job to be round and properly located when the cylinder head is stressed from assembly to the block. The vacuum test checked out good with both the torque plate on or off the head. This was a bit of a surprise. We expected this head to have a significantly worse valve seal without the plate (and its stresses) in place. However, the cylinder leakdown test did show some significant improvements. At low cylinder head torque (40 ft-lb), the cylinder leakdown averaged 12% with a standard deviation of 1.2 points. The lowest cylinder was #5 at 10% while cylinders #1, #2 and #6 all checked in at 13%. Measurements were made along the way as the fasteners received a total of 190 degrees of angle to reach the final torque of 140 ft-lbs. At each interval, the leakdown from the cylinders didn’t change. Unlike the situation that occurred with the non-torque-plated valve job, you could not hear the leakage of air past the valves and through the intake and exhaust ports. By the time the cylinder head was torqued to its final spec, average leakdown had decreased to 11% while the standard deviation was just 1.8 points. Cylinder #2 checked in at 14% (+1% over the baseline) while cylinder #5 dropped from 10% to 9%. The DCM process using the cylinder head torque plate proved to be a success. We don’t plan to ever perform another RB26 valve job without a cylinder head torque plate in place. In fact, we are currently in the process of designing and building the plates for 2JZ, 4G63, 4B11, FA20, EJ25, B-/K-/F-series Hondas and of course VR38. 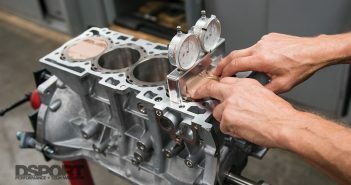 Just like when a torque plate is used to hone the cylinders, the same head gasket (a used one of the type that will be used is ideal) and the same head fasteners that will be used for the actual engine must be utilized to simulate the exact stress and strain on the head to create the same distortion. In this way the DCM can be performed correctly to deliver a valve job that minimizes valve leakage, increases performance and maximizes valvetrain life. We can’t wait to see the leakdown results on the engine after break in. Record power numbers and record elapsed times are sure to come. While it took some time to conduct the research, build the tooling and perfect the process, Club DSPORT was able to find a solution to eliminate the undesirable side effect. Soon, new power records will be recorded for these engines.